with Leslie's Illustrated Weekly. She was a remarkable woman endowed with natural beauty, flamboyance, a penchant for adventure and a flare for self-promotion. Soon she was traveling the country alone searching for stories, learning to drive an automobile, and displaying an independence not expected of a woman at the time. Her role as a theater critic for Leslie's brought her into contact with New York's "Jet Set" of the day. Here she met a flying instructor and asked him if he would teach her to fly. She began her lessons in May 1911 at a flying school on Long Island becoming the first woman to begin flight training. The airplanes of the day were rickety affairs - collections of wood and canvas held together with piano wire. There was no science of flight, no rules on design or construction, the books were still being written. Experimentation was done in the air and lessons learned through fatal accidents. Harriet proved she had a natural flying ability, excelled in her training and earned her pilot's license in August - the first American woman to achieve this. She immediately joined the exhibition circuit, flying at meets in this country and Mexico. Dressed in her plum-colored, satin flying suit adorned with elegant jewelry, she became an immediate sensation. Her articles in Leslie's sold thousands of newspapers and spread her fame. In 1912 she traveled to England convincing the London Daily Mirror to fund her attempt to fly the English Channel in exchange for exclusive coverage. It had been only 3 years since Frenchman Louis Bleriot successfully flew across the Channel and the attempt had never been made by a woman. Harriet made her flight in the early morning hours of April 16, reversing her French predecessor's route by taking off from Dover. She landed her Bleriot monoplane in triumph on the French shore near Calais, assuring her fame and assuming the title "America's First Lady of the Air." It was not to last. Ten weeks later Harriet's life would end in a tragic accident over Boston Harbor. On July 1st, during an exhibition, Harriet flew the event's manager with her to Boston Light at the harbor's entrance. On the return leg, the crowd watched in horror as the plane suddenly lurched and first the manager and then Harriet were flung to their deaths in the harbor 500 feet below. Harriet's aviation career had lasted only eleven months - her candle had burned briefly but brightly. "The sky seemed clear, but patches of cloud and masses of fog here and there obscured the blue. The French coast was wholly invisible, by reason of moving masses of mist. The wind had not come up yet. The smooth grounds of the aerodrome gave me a chance for a perfect start. I heeded Mr. Hamel's (an assistant) warning about the coldness of the channel flight and had prepared accordingly. Under my flying suit of wool-back satin I wore two pairs of silk combinations, over it a long woolen coat, over this an American raincoat, and around and across my shoulders a long wide stole of sealskin. Even this did not satisfy my solicitous friends. At the last minute they handed me up a large hot-water bag, which Mr. Hamel insisted on tying to my waist like an enormous locket. It was five-thirty A.M. when my machine got off the ground. The preliminaries were brief. Hearty handshakes were quickly given, the motor began to make its twelve hundred revolutions a minute, and I put up my hand to give the signal of release. Then I was off. The noise of the motor drowned the shouts and cheers of friends below. In a moment I was in the air, climbing steadily in a long circle. I was up fifteen hundred feet within thirty seconds. From this high point of vantage my eyes lit at once on Dover Castle. It was half hidden in a fog bank. I felt that trouble was coming, but I made directly for the flagstaff of the castle, as I had promised the waiting Mirror photographers and the moving-picture men I should do. In an instant I was beyond the cliffs and over the channel. Far beneath I saw the Mirror's tug, with its stream of black smoke. It was trying to keep ahead of me, but I passed it in a jiffy. Then the quickening fog obscured my view. Calais was out of sight. I could not see ahead of me or at all below. There was only one thing for me to do and that was to keep my eyes fixed on my compass. My hands were covered with long Scotch woolen gloves which gave me good protection from the cold and fog; but the machine was wet and my face was so covered with dampness that I had to push my goggles up on my forehead. I could not see through them. I was traveling at over a mile a minute. The distance straight across from Dover to Calais is only twenty-five miles, and I knew that land must be in sight if I could only get below the fog and see it. So I dropped from an altitude of about two thousand feet until I was half that height. The sunlight struck upon my face and my eyes lit upon the white and sandy shores of France. I felt happy, but could not find Calais. Being unfamiliar with the coast line, I could not locate myself. I determined to reconnoiter and come down to a height of about five hundred feet and traverse the shore. Meanwhile, the wind had risen and the currents were coming in billowy gusts. I flew a short distance inland to locate myself or find a good place on which to alight. It was all tilled land below me, and rather than tear up the farmers' fields I decided to drop down on the hard and sandy beach. I did so at once, making an easy landing. Then I jumped from my machine and was alone upon the shore. But it was only for a few moments. A crowd of fishermen - men, women and children each carrying a pail of sand worms - came rushing from all directions toward me. They were chattering in French, of which I comprehended sufficient to discover that they knew I had crossed the channel. These humble fisherfolk knew what had happened. 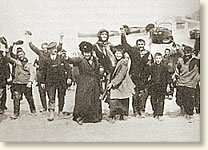 They were congratulating themselves that the first woman to cross in an aeroplane bad landed on their fishing beach." Holden, Henry M., Her Mentor was an Albatross (1993); Quimby Harriett," An American Girl's Daring Exploits" Leslie's Weekly (May 16, 1912), reprinted in: Harris, Sherwood, The First to Fly: Aviation's Pioneer Days (1970); Wohl, Robert, A Passion for Wings (1994). 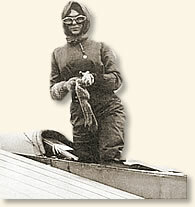 "First Woman to Fly the English Channel, 1912," EyeWitness to History, www.eyewitnesstohistory.com (2002).